We proudly share results from our Holistic approach to Women Hair Loss Treatments because they make such a positive impact to women self-esteem, confidence, hair health, skin, lifestyle and overall health. Women Hair Loss Treatments, this case history: Distressed woman, age 47, experiencing both hair loss and hair thinning for 6 months. Past and current stress, cessation of birth control etonogestrel implant Implanon used to stabilise abnormal menstrual cycle which was not delivering desired effect. Please note starting or stopping any medication can in certain individuals be the trigger for diffuse hair loss. Diffuse hair loss is hair loss double than that of your usual daily hair cycle hair loss. Diffuse Hair Loss begins three months ‘after’ the actual event that was the trigger or cause. When you make a time line it is easy to confirm the trigger. In this particular case the removal of Implanon implant was the cause and was set perfectly on the time line. After the removal menstrual cycle returned to normal in this case which is an additional positive. Following a bout of Diffuse Hair Loss it is common to also find some Female Pattern Thinning that had been slowly creeping in. 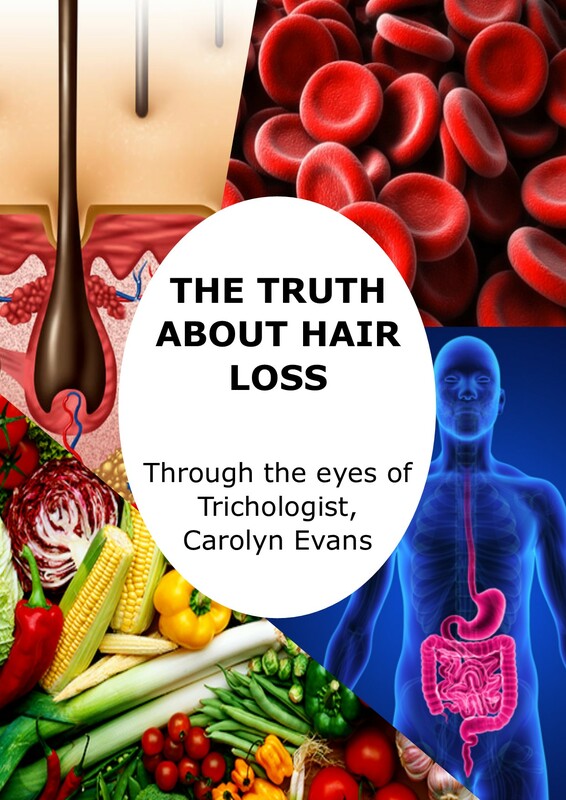 Female Pattern Thinning is not Hair Loss as in hairs actually falling out, it is hairs gradually thinning caused by DHT (Dihydrotestosterone) and can be triggered by hereditary, hormones, environmental and free radical factors. Microscopic diagnosis allowed me to quickly and easily see the hair was not growing as per genetic hair type from past diffuse hair loss. 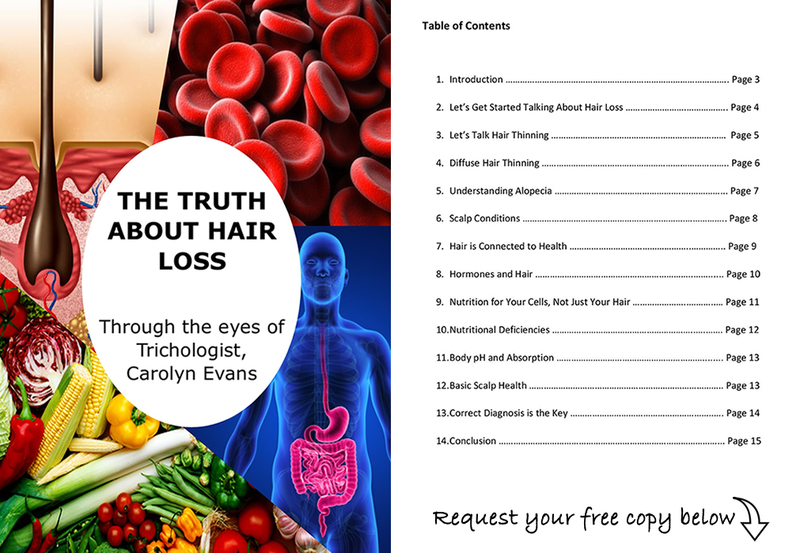 The recent diffuse hair loss shed had exposed many underlying factors that had been happening gradually for a long time, this was tracked back through health and hair history. Complete Combination Therapy including both Nutritional and Topical treatments was introduced and followed for 4 months. Results are tracked with microscopic and digital images as shown in video here. It is difficult for someone recovering with hair loss to notice the changes on a daily basis, this is why tracking both microscopically and digitally are important. An easy to follow maintenance program is being continued with Home Care Hair Loss Treatments and we will track the progress every 4-6 months. Combination Therapy Hair Loss Treatments needs to address all symptoms and causes. For this we do need you to keep a check in on health through Blood Test Results. Even if your doctor said everything is within range, we do understand certain levels are required for hair which may appear normal for health. We advise how to maintain body balance and in-turn hair health and are here as your hair support group. Absolique Results Women Hair Loss Treatments images are 4 months apart and you can see the hair is filling in, less scalp is visible hair has visually more strength, structure, shine and volume. Absolique Results Women Hair Loss Treatments.